Software and data will be an essential part of Toyota's strategy going forward, Gill Pratt said. LAS VEGAS -- Two months after Toyota announced a $1 billion investment in a forward-thinking r&d venture, the project’s CEO introduced on Tuesday the team of experts he’ll be working with, a group that includes voices from government, academia and industry. The seven-person technical team working under Gill Pratt, head of the newly formed Toyota Research Institute, includes James Kuffner, the former head of Google Robotics; a pair of Massachusetts Institute of Technology professors; and two former program managers at the Pentagon’s advanced research arm. A separate eight-member advisory board will be chaired by John Roos, the former U.S. ambassador to Japan, and includes Richard Danzig, former U.S. Navy secretary; the former president of r&d at Walt Disney Imagineering, and the directors of both Stanford’s and MIT’s artificial-intelligence labs. Pratt and his team will be at the center of TRI’s research into artificial intelligence and robots. 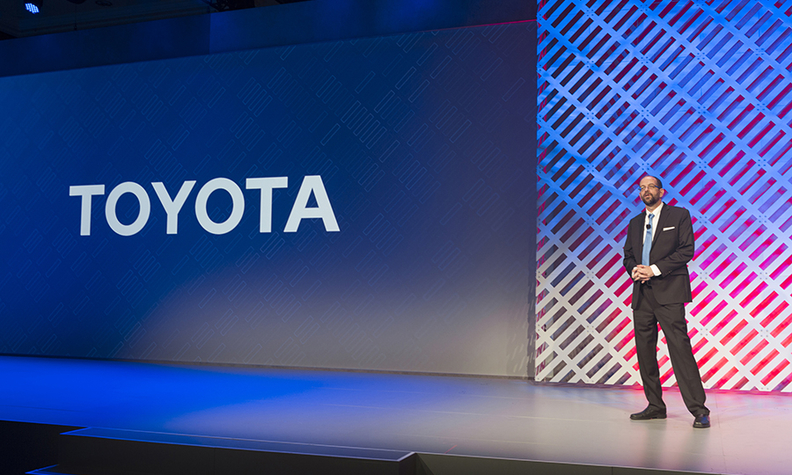 Software and data will be an essential part of Toyota’s strategy going forward, Pratt said. Gill Pratt, far left, and his team will be at the center of TRI's research into artificial intelligence and robots. Toyota announced the $1 billion TRI venture in early November, and as part of the investment, pledged $50 million to open two research centers this month in the U.S. -- one at Stanford and one at MIT. Pratt, a former program manager for robotics at the U.S. Defense Advanced Research Projects Agency, was chosen to head the venture. TRI has several goals, all of which it seeks to accomplish through increasing levels of autonomous driving and artificial intelligence, including enhancing vehicle safety, improving transportation options for elderly and disabled people; and accelerating scientific discovery.